A Sad Passing.... Vine Deloria, Jr. The great indigenous visionary, philosopher, author and activist Vine Deloria, Jr. passed over to join his ancestors today, November 13, 2005. Our thoughts and prayers go to his wife, Barbara, to his children and his other relatives. The passing of Vine creates a huge intellectual and analytical void in the native and non-native worlds. He will be greatly missed. It is appropriate on this website to reflect on the meaning of Vine's contibutions to indigenous peoples' resistance, and to reflect on our responsibilities to maintain and to advance the lessons that Vine gave to us. 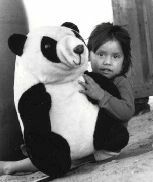 It is safe to say that without the example provided by the writing and the thinking of Vine Deloria, Jr., there likely would have been no American Indian Movement, there would be no international indigenous peoples' movement as it exists today, and there would be little hope for the future of indigenous peoples in the Americas. He had the courage and the vision to challenge the dominating society at its core. He was unapologetic in confronting the racism of U.S.law and policy, and he was prophetic in challenging young indigenous activists to hone their strategies. We will write much more about Vine in the upcoming days. He was our elder statesman and mentor. For now, we will share this passage from "Custer Died For Your Sins," as a reminder of our responsibilities, and to ensure that we are more deliberate and strategic in our resistance. "Ideological leverage is always superior to violence....The problems of Indians have always been ideological rather than social, political or economic....[I]t is vitally important that the Indian people pick the intellectual arena as the one in which to wage war. Past events have shown that the Indian people have always been fooled by the intentions of the white man. Always we have discussed irrelevant issues while he has taken our land. Never have we taken the time to examine the premises upon which he operates so that we could manipulate him as he has us." For many of us, Vine was a contemporary Crazy Horse. Perhaps we squandered his time with us. We took him for granted, and assumed that he would always be with us. Now, the question is, not only will we produce more Crazy Horses, but will we produce more Vine Deloria, Jr.s? Vine, we will miss you, but we will continue your work toward freedom for native peoples everywhere. Mitakuye Oyasin. I am writing to share some sad news. Phil's dad passed away early yesterday morning. We were in Chicago, where Phil gave a talk at Humanities Festival. We got a call about 11:00 pm on Saturday night to find that Vine had been rushed in for emergency surgery. He survived the surgery but already weak from two major operations, in the last few months, he passed due to complications from a ruptured abdominal aortic aneurysm. Many of you knew Vine and many of you knew of him. While we are saddened by this loss, we take comfort imagining him finishing his latest book, starting on a new one, smoking an unfiltered cigarette and listening to cowboy tunes! He was truly a man who made a mark! You have offered us so much support over the last few months and for that we are most grateful. Thank you for your ongoing kind thoughts and best wishes. 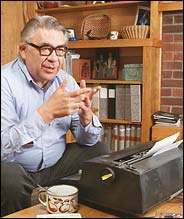 "His Body of Work, in Memoriam: Vine Deloria, Jr."
Paper proposals are now being accepted for a panel dedicated to the breadth of work and teachings of Vine Deloria, Jr. in the Native/Indigenous Studies Area. Given the immediacy of this since his very recent passing, I'm happy to accept titles and very short abstracts for submission. Ideas can be fleshed out more later on. This will be a permanant panel for this conference. The deadline for submitting proposals is December 1, 2005. Inquiries regarding this area and/or abstracts of 250 words may be sent to Sara Sutler-Cohen at the email below. Please forward this email to people who would be interested in participating. Ya'at'eeh WSDP supporters: Passing of Elder - Kee Shay, a Big Mtn elder and an advocate against relocation, passed away on May 11th. 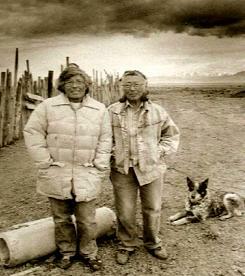 The burial will be at his place(info from wife-Mae) south of Big Mountain, on May 17th, 10 AM(rez time) 9 AM (PDT 2005). "there are our children, even the babies..."
Today I'll be writing about what I remember and the way I see it in my mind and the way I actually have seen things with my own eyes. Today I'll be talking about that. Right now this evening I will be saying from here in the Big Mountain region what I have witnessed. Here there were our ancestors, there are our children, even the babies. In this world our way of life has continued through generation after generation, we can't count how many. So it is and so it will continue into the future. So we need to consider the future of this land for the children. As the Creator made it, it has always been and so it will be for the future generations. The Creator made this land for us and then we were put right here within the four sacred mountains. They are the San Francisco Peaks, Sierra Blanca Peak, Mt. Taylor and Big Sheep Mountain. That is the creation story that came through our grandparents. The mountains all have spiritual names. There are a lot of other mountains. Every one of them has prayers and songs. The Creator put them down for us when the Din� came into being. The Navajo wedding basket was given to us. The four sacred mountain bundles were given to us. These bundles came from the sacred mountains and became medicine for us. They have been with our ancestors always and were passed down. To this day the prayers, the songs and all other natural elements that are part of this earth gives us the connection to the spiritual world and they look upon us to this day. Even though the old people went on, the Creator still expects us to care for what we were given. That is this Black Mesa. We know these are sacred mountains and we have two here, Black Mesa which is the female and Lukachukai which is the male. We live on these mountains and we are the grandchildren of them. We are the only ones who know these ways. I don't think you in Washington can understand them. I don't think anyone will ever give us a good life except the Creator. Right now our prayers are through and within the Mother Earth. Also through the universe which is the sky our father that we pray to. The holy water we pray to, into the darkness, we pray, into the dawn we pray, then into the sunset we also pray. Every day we have sunrise and at night the moon. To these we have our prayers and songs. In the prayers we ask for humbleness. It seems like the U.S. government will never recognize us. It seems like the white man does not see us. At the time of your discovery of the Din�, you already knew they were the Din�. But to this day you hide from that knowledge. You have never recognized us as the human beings we are. From the white man there has never been acknowledgement of what has been done to the Din�. You hide from your own truth. You hide from the elders and the youth. That is the forced march to Fort Sumner. You made the people suffer. Along the walk you murdered them. You killed the women who were having babies. You killed the old ones, the hungry ones. That murdering and suffering went on for four years, 1864 to 1868. You did this to people you didn't even know, you didn't know how humble they were. When will you acknowledge what has been done to our people? When will it stop? From the days of white man's first invasion of North and South America you still in 500 years have not acknowledged the natives who lived here. There was only your own self-interest. Immediately you started to destroy our cultures. You came here for religious freedom, yet you classify us as low, low beings. You created poverty, hunger, helplessness, and disease among us. When the land was given to us all things were in balance: the animals and the plants were given to us for food and medicine. The buffalo, the deer and the antelope. It was the Beauty Way. Then came the Europeans, dividing up the lands into states and counties, killing all the buffalo. Refusing to recognize the cultures that were here first. Now you are strip mining for coal which you are trying to sell overseas. You are taking the uranium out of the ground which was put there for the balance of the Mother Earth. You got wealthy on it. You got rich on it. At one time there was high quality water in Black Mesa. Many natural springs that ran free. They were put there by the Creator for the people and the animals to use. Then the U.S. puppet Tribal government built walls and dams so now we can not use the water, the animals can not run free anymore. We used to have a lot of wood here, but because of the clearcutting on Black Mesa the wood is scarce. When we pray it is not just for one small area but for all over. To this day it is so sad to us that our ways are disappearing before our very eyes because white man refuses to really see us. The Creator still looks upon us. He knows it is not our fault these things are happening to us. There are a lot of materialistic things that have been brought into our world which are hard for us to resist. The things that can destroy us are open to us in every white man's city. Alcohol, we don't know how to use it. We abuse it sometimes. Here all our leaders talk about how we are going to have a good world, a good life. They tell our children they'll have good opportunities in the schools. They take them when they are barely 5 years old. Nobody in the schools tries to preserve our good ways of life, our medicine ways. Not the Tribal government and not the U.S. government. I never heard of a Tribal Chairman work to preserve his own culture. They tell us we are going to live in a good way in this nation, but it is not as they say. Nowadays we can't go to our sacred places because of government policy. I think this world is heading for purification of Mother Earth because we have messed up the environment from fossil fuels and the production of energy in our Four Corners area. It is destroying our culture, our ways of life. A lot of people have become refugees, they are confused. A lot of times there is no free speech or free press. You only recognize one government and you only listen to one side of the story. The one you think might benefit your government. They tell the Hopi that the land belongs to them now, but I don't think they will ever benefit by being out here. They will also get fooled by the U.S. government. The strip mining and the so-called economic development will not help the Hopi people. The government is just using the Hopi Tribal government as a puppet. Just as the Navajo have been helpless in the face of the bureaucrats so it will be for the Hopi. I plead for you to understand what I am saying. To all of you, the U.S. government, and the governments of the Navajo and Hopi: not until the day you all understand will there be healing for the people and the Mother Earth. It is the abuse of the industrialized nations that has created the hole in the ozone. This they will not heal. Not any government will heal this hole in the universe. The only way is we have to pray from the heart, that we shed tears, maybe this is the only way to fix it. Only if the Creator has compassion for us. Maybe from that we will have a balanced world. This goes for everybody on the face of the earth including all of you. Maybe we will have a better world that way. The Creator might give us another chance. Forgive us for all our destruction. I can see we can still be blessed here on Black Mesa. There is still some balance here. The abuse of Black Mesa water and the Colorado River. All these waters are going to the rich people on the West Coast. You should respect the first Americans. You came here as foreigners and now you are stomping on everybody and taking away all their rights. I'm sure the Creator does not like this. You are abusing the children, neglecting and destroying them. All you white men the nature warns you, the floods, hurricanes and big storms. If we can not bring balance back to nature, most of us might have to pay with our lives. "You are abusing the children, neglecting and destroying them." When you first came to the so-called New World, why did you come? For what purpose are you here? Were you helpless when you came? Over here you develop all kinds of weapons. Nuclear bombs. Now you threaten all of creation. You take your weapons to the land where the basis of Christianity was created. I'm sure there are humble people there. I'm sure they all suffer. I'm sure they want to live in a peaceful way. Now you are threatening them. You are having war with them. A lot of our young peop le are there with weapons in their hands. We Navajo served in both World Wars, Korea, Vietnam, Panama and now in the Middle East. In return you don't think about us. You are destroying our ways. Yet we have helped you in your ways. We worry about our young people. It seems like we have no say over our own children. You just take them away. You do that with all the children, red, white and black. I'm sure all the parents are concerned for their children. It seems like the U.S. government has no mercy for the human race. The U.S. government should think humbly, he should think in a good way. What's wrong with living in a peaceful way with harmony among all people? We should all think in a good way between all the races. This way we will all have a better world. We are all special in different ways. We can have a beautiful world without the wars. When our forefathers went to Fort Sumner, they laid down their weapons. They signed a treaty that we would no longer pick up weapons. Now the Navajo people are holding weapons in their hands to protect your oil interests. It seems like you force them to do this. I'm sure they are all humble. Go fix up your mind. I think you are out of your mind. Maybe you should reconsider yourself. Think back to 1868 when you took our weapons from us. When you reconsider this you will know you lie. Think about these words. I thank you for it. There is really no peace among us and there is a lot of natural disasters in our world because we create these things for ourselves by our thoughts and our actions. Until the day we have peace among us, until the day you let native people live the way they want. That day everything will be good again with nature in balance. We should all think back into our hearts and act from that place. I just said what I think this evening. I hope these letters reach into your heart and all the hearts of the government. We went to Washington, D.C., with a statement to deliver, but they didn't want us in Washington. They told us to take it to Phoenix, but they didn't want us either. It is now in a circuit court in San Francisco. Why do you have to refuse us? Not accepting us, not listening to us. All the Native Americans, starting with the Navajo. All the Native Americans will not be listened to. It seems like the white men will not listen to any of them. In a lot of ways they are poor, in a lot of ways they are suffering. You can see it right here. The government ignores them. The reason why I say this, I went to Washington where the White House is. When I went there I saw the beautiful houses and buildings you live in. They told me all the leaders here are doing their work. Then I saw on the streets people sitting on the sewer grates trying to keep warm. I saw all nationalities there. When I looked at them they looked really helpless. I felt sorry for them. They were there with their children. Why does the U.S. government not see the people there trying to keep warm? That's where the leaders are. I say to myself why do they not see this? Some of the people have no food, they aren't even eating, they are begging for change. They were just sitting there helpless. I thought to myself why are these people here like that? Where did they come from? What so-called progress put them there? I thought maybe someday when the white people come to our lands and build their cities our people will be like that. What I've talked about and what I've said is what I know and is all I have to say. I hope you take it in deep concern. Go in Beauty, be in beauty forever... We shall miss your presence and words from the heart of your people, Dineh. To Everyone who has sent such kind words - thank you and keep up your spirit - it's what Mary would have wanted. Following is a short personal statement by Carrie Dann on her sister's passing. "We want to let people know that we are doing ok and we will be strong. There was a three day visitation for Mary beginning on Friday evening. Her body will be cremated and her ashes released to become part of the earth and nurture her and nurture life, as it was meant to be. You must remember she came from the earth and she is returning back to the arms of her mother, the earth. She has completed the cycle. This earth mother will cradle her forever. The wind will carry her body in all four directions those of us remaining here in the physical world we must be strong - stronger now for those who have passed ahead of us and those that who are yet to come. Mary believed in living her life for the protection of her family, the life - the sacred (the land, the air, the water, the sun) and for the future generations." "We must remember that Mary stood proud, strong, dignified, respectful against all types of racial discrimination, desecration of her spiritual ways by the BLM, Department of Interior (who claimed to be her "trustee"). She stood up against the mining industry, the nuclear industry, the energy industry. Mary never took no for an answer but she stood her ground for what she believed in and for the Truth. Not because she wanted to, but because she had to. I will continue to do this, even with my sister gone. I believe in these things also." "We must always remember the future generations and protect the sacred things so that the little ones coming behind us will be ok. The struggle will go on." to Speak in Seattle May 5-7, 2005. Carrie Dann is a Western Shoshone grandmother and activist, who, with her sister Mary, has been at the forefront of the Western Shoshone Nation’s struggle for cultural and spiritual rights and land rights. The Danns have squared off against international gold mining corporations, the nuclear industry and the U.S. government. Carrie Dann is considered a living legend in the struggles of Native Americans. This will be Carrie’s first public speaking engagement since the death of her sister Mary on Earth Day, April 22, 2005. In memory of her sister, her life partner, and their struggle for the rights of indigenous peoples, Carrie stated last week: “Mary would want us to be strong. She believed in living her life for the protection of her family, the life - the sacred (the land, the air, the water, the sun) and for the future generations… I will continue to do this, even with my sister gone. … We must always remember the future generations and protect the sacred things so that the little ones coming behind us will be ok. The struggle will go on." Those of us who followed the Owl and safely did our duties for the warrior society, owe our lives to our brave Uncle Wallace Black Elk and we owe our gratitude to the kindness and comfort of his companion Auntie and Mother, Grace Black Elk. On the final days of the Knee they were two of the last people to leave the Knee, they stayed for the people as long as they could. When they finally surrendered and left with the last of the people, the wasicu knew it was over. They abused my parents, they attacked them, stole their sacred objects, they tore the Pipe from their hands and shattered it in front of their eyes. They handcuffed our holy man and threw his wife on the ground. The whiteman ground their sacred Eagle Feathers under their boot heels and they laughed at their tears. They thought that they were attacking the heart of a defeated nation by hurting our brave and gentle medicine man and his Grace, but they were wrong, they were so very wrong. Wallace Black Elk had already passed his spirit to all of us who were priviledged to sit with him around the fire. He had already made it possible for our people to be proud in knowing we could fight and survive. Wounded Knee is still there, the spirits of Wounded Knee remain and so does my Uncle Wallace Black Elk... forever.